Thoroughbred's TS WebServer is the complete e-Commerce/e-Business development system. 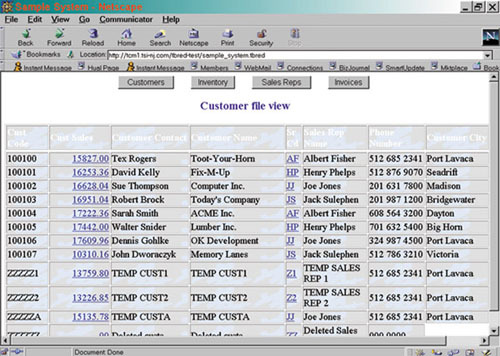 Processing orders from a shopping cart system to on-line transaction processing on the Internet is easy to accomplish. From applications development to a finished Internet "ready to run" product, Thoroughbred's TS WebServer is the environment to develop and run your Internet-based application. TS WebServer is Thoroughbred's answer to Rapid Application Development (RAD) of e-Commerce/e-Business Internet-based applications. 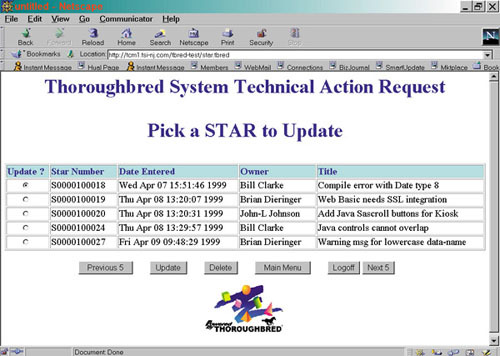 Thoroughbred's TS WebServer provides a performance based web server platform based on Thoroughbred's OPENworkshop® Object Oriented Technology. TS WebServer employs the Linux Operating System to provide a stable, cost effective operating platform, Thoroughbred's WEB API, the popular Apache Web Server supporting SSL, for secure credit card transactions, and OPENworkshop, Thorougbred's RAD system. Applications can be developed in either 3GL, 4GL or with OPENworkshop methods. The Thoroughbred Web API operates as an integrated process with the Apache Web Server. This provides instant scalability as the number of requests or "hits" increases. Unlike commonly used CGI interface scripts which can be slow, the Thoroughbred Web API can reside on the WebServer or the application server resulting in rapid user response. The Thoroughbred Web API runs in the background, and incurs very little processor overhead unlike CGI task-based systems. The flow of an application starts with the user/browser submitting data via an HTML POST or GET Method to the Apache Web Server. This request is sent from the Apache Web Server to the Thoroughbred Web API. The Thoroughbred Web API then communicates with the Thoroughbred-based application. The Apache request includes connection information for the back-end service and application specific information, i.e. data in a form which is then processed by the Thoroughbred application. The Thoroughbred TS WebServer application controls the generation of succeeding Web page sequences. There is not a one-to-one correspondence between the Web Browser request and an instance of the Thoroughbred Web API. Each request is independent of the previous. This provides for the development of "dynamic" HTML pages. The HTML page design can be developed with any commercially available HTML editor. TS WebServer eliminates the pitfalls of "canned" e-Commerce systems where you are at the mercy of the providers limitations. TS WebServer enables you to develop completely interactive Web-based applications that you control. For e-Business based applications, complex interactive business applications can be developed with Thoroughbred's OPENworkshop Object Oriented development system. Thoroughbred's Solution-IV Accounting® and Distribution System can be employed as a fully functional Internet based system as well. Thoroughbred can design an e-Commerce/e-Business solution designed to your specifications, complete with the TS WebServer and applications; or Thoroughbred can host your e-Commerce/e-Business requirements with a solution designed specifically for your business. Contact us on our toll free number at (800) 524-0430 or at our email at for details. This is the customer' existing application/data server and local network (3) running Thoroughbred-based applications. A TS Network DataServer must be present on Machine A with an available port(s). The Web Server must have a URL connection, TS WebServer software, Linux operating System (other operating systems are available for a porting fee), Apache Web Server with optional SSL for secure transactions (i.e. Credit Cards) and security hardware (firewall). The Web Server can be located remotely from the Application Server, providing the proper TCP/IP communications (2) and security exist between it and the Applications Server. In some cases, where the Applications Server is not process intensive, the Web Server and Applications Server may reside on the same machine. There may be additional security issues to address in this case. How TS WebServer Works - A request is made via an HTML page by the client (1) that is processed by the Apache WebServer. If the requests includes a .tbred extension, then Apache will rely on a Thoroughbred module mod_tbred (built for Apache) to complete the request. Then mod_tbred passes the request to a designated Web Basic Control program. The Web Basic is a background process (daemon). The Control program will be responsible for processing the data and creating the next HTML page to be displayed in the client browser (1). The mod_tbred component and the Web Basic both reside on the TS WebServer (Machine B). The Web Basic will require access to the application data, which is stored on the local network (Machine A). The communication between the Web Basic (Machine B) and the application data (Machine A) is accomplished using the TS Network DataServer (installed on Machine A). The Web Server (Machine B) can have multiple Web Basic processes monitoring different types of Web requests (General e-commerce, Shopping cart application, credit card verification, etc.). The advantage of using TS WebServer is that there are no cumbersome CGI scripts to write or use, and the application and data access are direct. The system is dynamic, and any changes to the Thoroughbred database are immediately reflected on the next client request. TS WebServer is the gateway to your e-Commerce application requirements using Thoroughbred-based applications. Thoroughbred Software International, Inc. develops and markets software development systems including Thoroughbred Basic (3GL), Dictionary-IV environment (4GL), OPENworkshop® (Object-Oriented programming), Solution-IV® Financial Applications, specialized applications for the Recreation and Reprographics industries, and supports a community of over 1,000 value added resellers and partners. Our products support a three tier architecture, are open-database and run on virtually any operating system including UNIX, Linux and Windows. Thoroughbred provides complete consulting services, customer support, training and maintenance programs for our products. THOROUGHBRED is a registered trademark of Thoroughbred Software International, Inc. TS WebServer is a trademark of Thoroughbred Software International, Inc. All other names, products and services mentioned are the registered trademarks of their respective vendors or organizations.